Adobe and Teardrops: Langhorne Slim -- The Spirit Moves AND Ticket Giveaway! Langhorne Slim -- The Spirit Moves AND Ticket Giveaway! The first time I saw Langhorne Slim and the Law, it was their last show before getting on the plane to Nashville to record this album. I already loved The Way We Move, and I was blown away by the band's on-stage tour de force. To quote an old press clipping about Cowboy Mouth, on a bad night they'll tear the roof off -- on a good night, they'll save your soul. 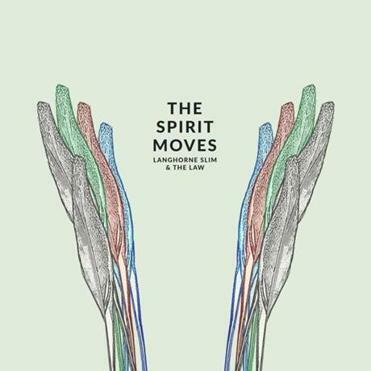 With that being said, The Spirit Moves is a complete misrepresentation of the band's love performance. It's also the most beautiful album you'll hear all year. That's not a bad thing, depending on your philosophy. For some, an album is (to quote No Depression's Raina Rose) an expensive business card, something fans can use to memorize song lyrics to tide them over between the shows. For others, the album should capture exactly what the band is live. And for still more, the album should put the songs in a different light than can be achieved on stage. Thanks to the helmsmanship of Andrija Tokic, (who has given us the Alabama Shakes, Benjamin Booker, and Hurray for the Riff-Raff, amongst other favorites), Langhorne Slim and the Law are captured in a more intimate setting. The Spirit Moves is in many ways quieter than the raucous, joyful The Way We Move. Though I had been hoping for more of the same, I'm happy with what we've got. It seems to me that sound mixing should be like makeup: you should never notice it if it's good, but you should notice if it' breathtaking. Whatever magic Tokic worked, it sounds as if Slim is crooning right into our ears even as Malachi DeLorenzo's exuberant drumming propels the songs forward. The songs, I feel, are a bit uneven. Slim cowrote most of the album with producer Kenny Siegal and, honestly, the songs he wrote himself are the strongest (on "Airplane" the pair rhyme the word "defenses" with "fences," which is pretty disappointing from the man who wrote the lush imagery in "The Way We Move".) While I can see Slim was going for an economy of words this time around, he unfortunately missed the mark a few times. However, Slim's delivery brings these sparse lyrics to life in a way nobody else can, thereby making these songs forever his. And they all fit right into his existing setlist. Tweet at BOTH of us telling us you want tickets! Get creative!